Coloring is getting a 21st-century makeover, courtesy of Crayloa and Griffin Technology. And best of all, the combination iPad app and stylus offering introduced by the two companies Wednesday means there’s almost no chance that your kids will wind up drawing on the walls. 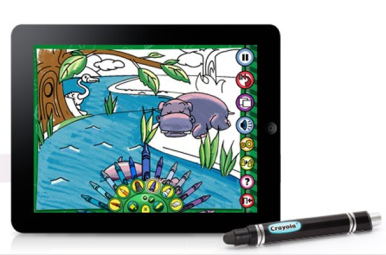 First previewed during January’s Consumer Electronics Show, the joint offering from Crayola and Griffin features a free iPad app—Crayola ColorStudio HD—that works exclusively with a $30 marker-shaped stylus called iMarker. The app offers 30 coloring scenes as well as an option to build your own scenes or use a free-draw doodle pad. Within the ColorStudio app, kids select a marker, crayon, pen, or paintbrush effect, and pick their colors. From there, young artists can start their masterpieces. The app also offers a “stay in the lines” option for those who have difficulty controlling their creative expression. The app differentiates between the stylus and fingers, so kids can change the page with their fingers and then use the marker only to color. Crayola ColorStudio HD also has sound effects, music and animation that can be added to the scene. After your future Picasso or Kahlo is done, their artwork can be uploaded to Facebook, emailed, or printed straight from the app. The stylus is currently available in Apple stores and works best when there is no screen protector on the iPad.